Another Specialty Equipment Market Association and Automotive Aftermarket Products Expo show is in the books, and the high-horsepower annual gathering concluded a four-day run Oct. 31-Nov. 3 in Las Vegas with very impressive numbers. Mike Henle As usual, SEMA drew incredible crowds at each of its venues at the Las Vegas Convention Center. Presented at the Las Vegas Convention Center, Sands Expo and Westgate, the gathering produced 118,000 room nights for an increase of 16.51 percent over the last three years, with 25 percent of the 165,000 registrants journeying to Las Vegas from other countries. SEMA attracted nearly 70,000 buyers who networked with endless companies. Second in size to the annual Consumer Electronics Show presented in January, SEMA was again a gear head’s delight with every conceivable engine-powered vehicle ranging from classic cars to new cars and motorcycles. The show also attracted more than 3,000 members of the media and generated an economic impact of $315.5 million. The show consumed every possible inch of convention space, whether it encompassed a display or an exhibition of new or classic vehicles. One area in front of the Las Vegas Convention Center was the site of some very loud and earth-rumbling vehicles competing in a form of drifting. While enthusiasts hung on for the ride of their lives in the passenger seat, the vehicles with throaty exhaust systems rumbled the earth and undoubtedly rattled the windows of surrounding hotel rooms. It wasn’t hard to recognize that attendees of SEMA enjoy Las Vegas and the energy the city generates. The dream child of Leo Kagan, who turns 101 on Nov. 17, and members of the Las Vegas Convention and Visitors Authority, the show moved to Las Vegas from its old home in Anaheim, California, in 1977. However, not everyone was happy with the move to Las Vegas. “I took a lot of heat for the move,” Kagan said. “I got called all kinds of names, and we added an industry newspaper that said I’d be the ruin of SEMA. It took several years before they saw that the opportunities in Las Vegas were endless. A lot of them were against the idea because there was a fear that the people would gamble and not go to the SEMA show. Gary Zeff, of Collingswood, New Jersey, said the overall attendance between SEMA and AAPEX is around 165,000. Michael Kazakov traveled from Los Angeles to feature his business Clinched Flares. “I have been coming to SEMA for 10 years,” said Kazakov, a 38-year-old Russian-born businessman. “I was sending product to Russia, but the economy there went flat about three years ago. We now manufacture wide body kits in Moscow, Russia, and sell primarily in the U.S., which is 80 percent of our business. “Mine is essentially the Cinderella story. It’s all about getting out and never giving up. I had been working in the computer business before deciding to follow my passion and getting involved in the automotive industry. Peter MacGillivray, 52, the vice president of events for SEMA, said the move took great foresight. “They were doing it for all the right reasons, because they wanted to build a marketplace for the hot rod industry,” he said. “While there were shows in the space, they were regional shows. The hope was to create a national market, and they felt Las Vegas was the best place to take it. The tragic massacre Oct. 1 did not hinder the show. 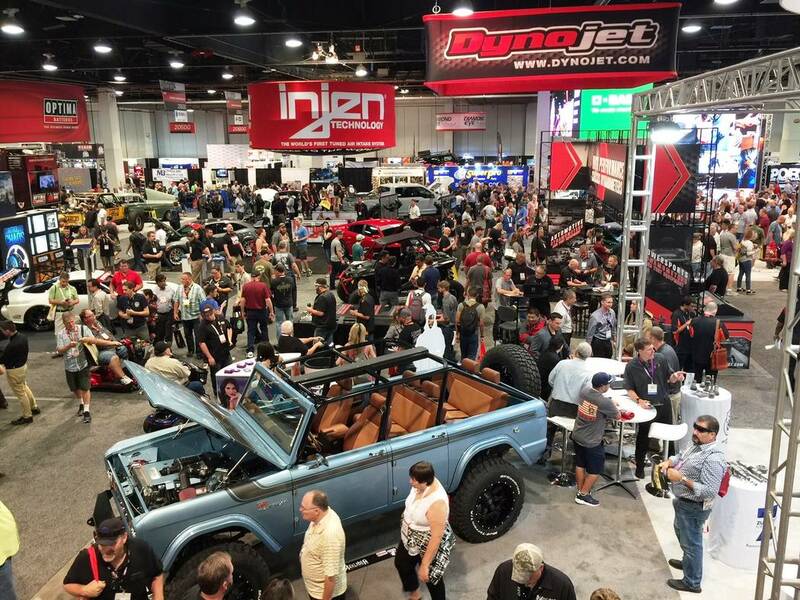 The SEMA Show and SEMA Ignited are organized by the Specialty Equipment Market Association, the trade organization representing the $41.2 billion automotive aftermarket industry.